Pallidal deep brain stimulation (DBS) has proven to be effective in patients with dystonia as it provides a long-term benefit for the patients. Some of them, however, experience either minimal alleviation or no benefit from this treatment, despite an appropriate electrode placement. The programming technique for DBS is the critical factor that affects the results obtained following institution of DBS for dystonia. The conventional programming includes adjustment for parameters such as amplitude, frequency, and pulse width (PW), or switching to a single/double monopolar or a bipolar setting. Interleaving stimulation (ILS) is a newer programming modality in which the two programs may be interleaved in an alternating fashion on the same lead and each program can specify the amplitude, PW, and electrode contacts desired. However, the frequency of stimulation for both these programs is the same, with the maximum frequency achievable being 125 Hz. A 25-year old male patient suffered from rigidity of limbs, torticollis, and dysphasia for 23 years. He ambulated slowly and often fell down. He could not accurately perform complex maneuvers, like eating with chopsticks. These symptoms got aggravated whenever he was excited or agitated, and got alleviated whenever he was in a relaxed mood. Thus, they were significantly impacting his activities of daily living. He was diagnosed as suffering from primary generalized dystonia by a neurologist. Bilateral globus pallidus internus (GPi) DBS (type 3387 electrode, Activa RC generator Medtronic, Minneapolis, MN) was placed 2 years prior to his present admission to our centre, with the primary indication being the persistence of his dystonic symptoms. The appropriateness of the coordinates of the final electrode placement were confirmed by fusion of the preoperative magnetic resonance imaging (MRI) and the postoperative computed tomography (CT) images [Figure 1]. An informed consent was obtained from the patient for carrying out the procedure. For the initial programming, we carried out a monopolar review, in which each contact was tested with increasing amplitude of stimulation to determine the functionality of the device, and also to establish the threshold for acute stimulation-induced adverse effects, which could limit the therapeutic threshold. We selected the best contact possible, depending upon the best benefit/adverse effect ratio and also based upon the imaging data of the electrode position. Based upon the commonly prevailing protocol, we usually assess these patients for their functional improvement following the DBS procedure at 3-month intervals. Due to the delayed improvement in the features of dystonia seen in our patient following the initiation of DBS, we initially chose the single monopolar stimulation that induced the largest acute reduction in the intensity and frequency of dystonia for 3 months. However, we found an unsatisfactory improvement in the features of dystonia and also noted a decrease in the Burke-Fahn-Marsden Dystonia Rating Scale (BFMDRS) score despite adjusting multiple programming settings. The patient was young and wanted to have a good quality of life. He had primary generalized dystonia, and although, over a period of time, there was a 36% improvement in the BFMDRS score [Table 1] utilizing a single monopolar stimulation, he was not satisfied with the programming, which did not significantly improve his dystonia and the quality of daily living. Therefore, we switched to a double monopolar stimulation using its submaximal amplitude, which, however, induced tetanic muscular contractions. In order to avoid muscular contractions, we continued to adjust the bipolar mode for 4 months but without deriving any further sustained benefit from the maneuver. Finally, based upon our experience of using ILS on patients suffering from Parkinson's disease, we resorted to applying the ILS in our patient also. This step resulted in a rapid and stable alleviation in the patient's dystonia to a significant extent. It also resulted in greatly improving the quality of his daily and social activities. We initially used ILS (125Hz) with double monopolar stimulation for 6 months. Each contact was stimulated by their individual submaximal parameters, which resulted in considerable improvement in the patient's dystonia, without any side effects being observed. In order to achieve a better and a more sustained benefit for our patient, we tried ILS with a low frequency (60Hz) and found a further improvement in his dystonia and in his quality of daily living, including an improvement in his usual activities such sitting and dressing. However, his speech had limited improvement and his dystonic features showed aggravation whenever he was excited or agitated. The stimulation parameters and the resultant BFMDRS scores during the whole programming process are listed in [Table 1]. Several procedures have been recommended in order to achieve the optimum programming, and to achieve the maximum effectiveness in the functioning of the DBS device installed for dystonia. First, some centers indicate that the beneficial effect of GPi-DBS depends upon the proper positioning of the electrode in the posteroventral region of the GPi, which is thought to represent the sensorimotor territory of the nucleus. Second, using multiple conventional programming methodologies helps to achieve the desirable outcome. Additionally, functional tests are utilized to objectively evaluate the benefits obtained and the side effects that occurred. Although the above-listed methods are systematically instituted, non-responsiveness to GPi-DBS does occur in a few patients suffering from dystonia. The reasons for the occurrence of these unsatisfactory results may be the following: (1) Unsuitable patient selection: Some patients may not respond to GPi-DBS due to their inherent constitutional disposition. (2) Patient's expectation and individual differences: DBS cannot alleviate all the symptoms of dystonia and meet all the high expectations of the patients regarding the degree of improvement that may be possible by the procedure. Due to the individual variability of patients, the effective programming parameters are customized for them. The size and anatomical position of the electrodes utilized for stimulating the GPi may differ in various individuals. (3) Unsatisfactory lead position: This may induce side-effects, an undesirable outcome, and a difficulty in programming the device. (4) Disease progression: With the progression of dystonia, the previously applied programming parameters may not remain suitable for a patient, and therefore, the parameters may require an adjustment. 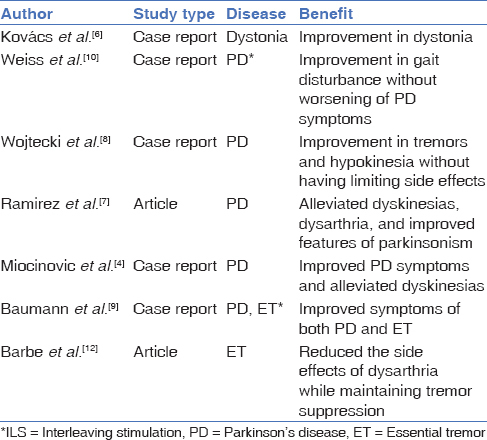 DBS may, therefore, have a limited benefit in patients in an advanced state of dystonia. ILS can shape the individualized current fields of the two programs. It may be administered with the aim of producing different areas of spread of the electrical field and tissue activation by the two programs. ILS can help to avoid anatomical regions that are associated with causation of adverse effects. It may also help to focus the stimulation on the desired area, which may reduce the side effects while preserving the benefits of the modality. In consonance with the findings of the reported literature, we report the case of a patient suffering from dystonia, who received ILS and achieved a satisfactory benefit after the conventional programming had failed in ameliorating his symptoms of dystonia. During the performance of ILS, we first used a higher frequency of stimulation (125Hz) and achieved considerable improvement in his dystonia. However, we found that ILS with a lower frequency of stimulation (60Hz) actually provided more benefit for this patient. This fact related to utilization of an optimum, rather than a high frequency of stimulus, has rarely been reported or utilized. We admit that sometimes improvement of dystonia may take up to an year or even longer to obtain; therefore, the long-term role of the conventional programming in actually having achieved benefit in our case cannot be discounted. However, ILS can shape the individualized current fields to reduce the side-effects and maintain the optimum benefits. In addition, the application of ILS on the patient, leads to a rapid, stable and significant improvement in the clinical features of dystonia. This fact irrevocably establishes the role of ILS in improving the manifestations of dystonia in our patient. Although, the conventional stimulation utilizing GPi-DBS is a routine practice in patients with dystonia, ILS may be utilized whenever the conventional programming is unsatisfactory in alleviating symptoms. ILS is not recommended as the first choice of programming and it is recommended only when patients have an unsatisfactory outcome or stimulation-induced side effects after using multiple conventional stimulations. During the stimulation process, ILS may induce new side-effects or the patients may request for new adjustments in the settings, which may result in the switching back of the stimulation to the conventional one. The actual role of ILS DBS has not been defined as yet as there only case reports alluding to its role. Future investigations utilizing controlled studies with larger patient cohorts will, therefore, be needed to irrevocably established its role in clinical practice. The authors certify that they have obtained all appropriate patient consent forms. In the form the patient has given his consent for hhis images and other clinical information to be reported in the journal. The patient understands that name and initial will not be published and due efforts will be made to conceal identity, but anonymity cannot be guaranteed. Valldeoriola F, Regidor I, Minguez-Castellanos A, Lezcano E, Rojo A, Salvador A,et al. Efficacy and safety of pallidal stimulation in primary dystonia: Results of the Spanish multicentric study. J Neurol Neurosurg Psychiatry 2010;81:65-9. Miocinovic S, Khemani P, Whiddon R, Zielman P, Okun MS, Chitnis S,et al. Outcomes, management, and potential mechanisms of interleaving deep brain stimulation settings. Parkinsonism Relat Disord 2014;20:1434-7. Kupsch A, Tagliati M, Vidailhet M, Aziz T, Krack P, Moro E,et al. Early postoperative management of DBS in dystonia: Programming, response to stimulation, adverse events, medication changes, evaluations, and trouble shooting. Mov Disord 2011;26:S37-53. Tisch S, Zrinzo L, Limousin P, Bhatia KP, Quinn N, Ashkan K,et al. Effect of electrode contact location on clinical efficacy of pallidal deep brain stimulation in primary generalised dystonia. J Neurol Neurosurg Psychiatry 2007;78:1314-9. Kovács N, Janszky J, Nagy F, Balas I. Changing to interleaving stimulation might improve dystonia in cases not responding to pallidal stimulation. Mov Disord 2012;27:163-5. Ramirez-Zamora A, Kahn M, Campbell J, Delacruz P, Pilitsis JG. Interleaved programming of subthalamic deep brain stimulation to avoid adverse effects and preserve motor benefit in Parkinson's disease. J Neurol 2015;262:578-84. Wojtecki L, Vesper J, Schnitzler A. Interleaving programming of subthalamic deep brain stimulation to reduce side effects with good motor outcome in a patient with Parkinson's disease. Parkinsonism Relat Disord 2011;17:293-4. Baumann CR, Imbach LL, Baumann-Vogel H, Uhl M, Sarnthein J, Suruco O. Interleaving deep brain stimulation for a patient with both Parkinson's disease and essential tremor. Mov Disord 2012;27:1700-1. Weiss D, Breit S, Wächter T, Plewnia C, Gharabaghi A, Kruger R. Combined stimulation of the substantia nigra pars reticulata and the subthalamic nucleus is effective in hypokinetic gait disturbance in Parkinson's disease. JNeurol 2011;258:1183-5. Barbe MT, Dembek TA, Becker J, Miester IG, Hartinger M, Fink GR,et al. Individualized current-shaping reduces DBS-induced dysarthria in patients with essential tremor. Neurology 2014;82:614-9. Manjunath M, Yadav R, Dwarakanath S, Jhunjhunwala K, Jafar A, Surathi P, Lenka A, Stezin A, Sampath S, Pal PK. Experience of pallidal deep brain stimulation in dystonia at a tertiary care centre in India: An initial experience. Neurol India 2017;65:1322-9. Alterman RL, Miravite J, Weisz D, Shils JL, Bressman SB, Tagliati M. Sixty hertz pallidal deep brain stimulation for primary torsion dystonia. Neurology 2007;69:681-8.